Challenge 1 sponsored by Young Nails asked our contestants to come up with their own personal caption or motto and to create a mural on 10 nail tips reflecting that caption. They were to include the text and an artistic interpretation of their caption. This week’s guest judge was Greg Salo of Young Nails. 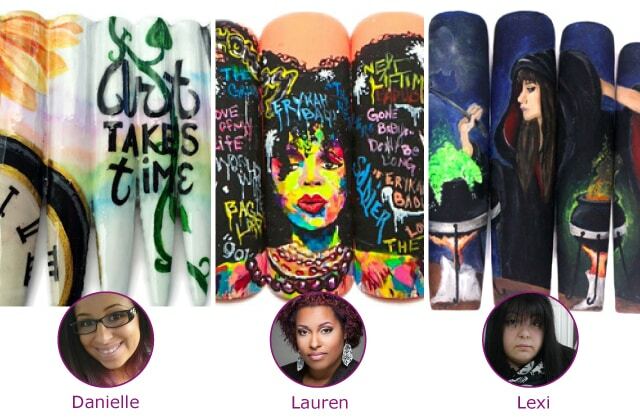 Permanent judges included CND’s Jan Arnold, NAILS Next Top Nail Artist 2014 winner Ryoko Garcia, NAILS editor Hannah Lee, NAILS senior editor Beth Livesay, and the rest of the team at NAILS Magazine. Danielle Costantino: The judges thought you had good brush control with nice crisp lines (especially on the clock) and were impressed this was the first time you’d used acrylic paints to create your nail art. The water color touch was lovely. The flower seemed a little out of place and the judges felt like the addition of more “time” elements could have made this a more cohesive design. Lauren Boyd: The judges were impressed with your comprehensive graffiti art and how the mural really did represent “organized chaos”. The portrait with the tagging in her hair is really a standout feature of this design. Your use of color and composition was spot on and totally representative of who you are as an artist. We would have loved to have heard more about your execution in your description. Lexi Martone: The judges thought your caption and art tied in beautifully together. Your handpainting skills and little details are top-notch. The green bubbles and the smoke have great dimension. The judges were actually split on the caption in the spell book. Some thought it was a clever way to integrate the words into your design, while others thought it was too understated and didn’t play a prominent enough role in the design. Amy Gustafson: The judges thought you did a great job capturing your “bling”-focused caption without being able to use embellishments. (And we also loved your caption!) We felt like your painting and line work on the hand needed a little more attention. Outlining the hand might have helped to keep the design cleaner and more detailed. Karrie Bowers: The judges love your color scheme citing that it was dynamic and eye-catching. Your caption also really hits home with all of the judges who are also dedicated to the power of learning. It’s a great concept. We were split on the execution. Some felt the background was a little too abstract with competing patterns and would prefer to see detailed handpainted work on challenges like this. Pay attention to your line work. Lavette Cephus: The judges were very impressed with your detailed painting of the girl and really like the 3-D, textured effect you created with the bricks. Your typography is also spot on. You have great crisp lines. It feels a little disjointed though. We’d like to have seen the design flow over the entire 10 nails. The right half with the caption seems a little empty. Lini Sherburne: The judges think your design is cute and unique. The textured background you painted is the standout of this design. We love the anime eyes on the cartoon girl and your line work, but the details of the girl and the kittens need more refinement. Our main issue is for a caption contest, you really can’t read the actual caption very well. It’s beautiful, but the calligraphy, as well as the colors used, makes it hard to read. Marisol Alvarado: The judges think your “beautifully broken” caption is unique and the cracks in your painting really help make that point. We also like that you chose to represent yourself through the meaning of your name with the sunset over the water. The overall concept is strong. However, the background design feels very familiar and cliché. NailGurl: The judges love your use of color and the attention and layering you put into your caption. We also like that you, more than any of the other entries, made the caption such a focal point. But that was only half of the challenge. We also wanted to see your caption illustrated as well. The hand is so well drawn, but you left us wanting more in terms of a design. It would have been great to have seen more of the story. We also would have liked to read more of a description about your concept and process. Sherri Traweek: The judges love your theme and inspiring message. The ombre background is well-blended and all of your flying machines are nicely drawn with great linework. There is so much going on, it’s a bit hectic and disjointed. We’d like to see a more cohesive design. The font in the caption could use crisper, cleaner lines. Simone Gilbert: The judges were very impressed with your painting of the lion. It makes a bold, visual impact on the black background. The brush strokes and composition and colors are really strong. And the matte finish adds to the final design. But we feel like the caption was a little bit of an afterthought that you added at the end. It could have been integrated better into the overall design with more thought into the handwritten words. Yesenia Oliva: The judges like your use of color and think your caption and theme are cute. The background has a nice textured feeling, but your overall art is too basic. You need to work on your handpainting and detail work if you want to make it far in this competition. We’ve seen hearts in all of your designs and are hoping you’ll branch out to other styles. Congratulations to Lauren Boyd, you’re this week’s winner! The judges were blown away with your detailed graffiti look. You really hit it out of the park with your “organized chaos look and were the favorite of many of this week’s judges. The bright, bold colors really captured our attention and your brush control detail was amazing. We really feel like we know who you are as an artist. Lauren will receive the following products from Young Nails (a $600 value): The full line of Young Nails’ Caption polish (60 Colors, 18 Top Effects, Base Coat, Top Coat, Matte Top Coat, and Drying Drops) and a wall rack. The nail tech who is packing up her paintbrushes this week is…NailGurl. NailGurl impressed the judges with her pop art-inspired, nail-focused caption. Unfortunately, she had to withdraw from the competition. We’re sad to see her go and wish her well on her future endeavors. Tune in Monday to find out the Week 2 Challenge and vote for your favorites! Good luck to Amy, Danielle, Karrie, Lauren, Lavette, Lexi, Lini, Marisol, Sherri, Simone, and Yesenia, who will all continue in the competition.